I love waffles. However, I am not a big breakfast eater, so I actually don’t love waffles for breakfast very often. But I do love waffles for dinner. Yes, I am big on breakfast for dinner. 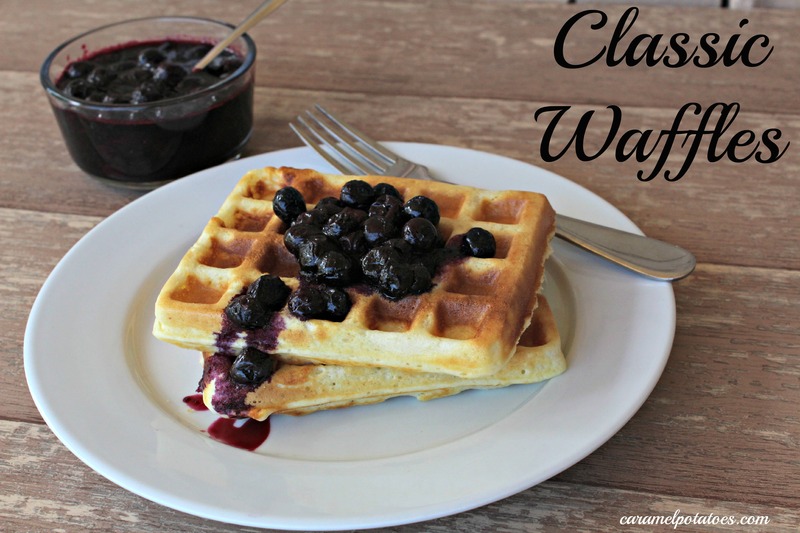 My kids love a big breakfast and so on those few mornings when I actually get out of bed early enough to make them a good breakfast; waffles are always a favorite. What is the verdict in your house, waffles for breakfast or waffles for dinner? In a large bowl, whisk together the flour, sugar, cornstarch, baking powder and salt until well combined. In a medium bowl, whisk together the eggs until combined, and then whisk in the milk. Gradually whisk in the butter. Pour the liquid ingredients into the dry ingredients and whisk gently just until the batter is evenly moistened. It’s fine if some small lumps remain. Give the batter a couple of folds with a rubber spatula to ensure that there aren’t and pockets of flour. Pour a generous 1/2 cup of the batter (or the waffle manufacturer’s recommended amount) into the center of the waffle iron. Use the rubber spatula to even it out and distribute it slightly (but there is no need to spread it all the way to the edges). Close the lid and bake the waffle to desired doneness. Remove the waffle and serve it immediately before baking the remaining batter. Or set it on a wire rack on a baking sheet and slide into a warm oven to keep waffle warm. Bake the remaining batter, transferring each waffle to the rack in the oven, or a plate. *Recipe from Waffles: Sweet, Savory, Simple by Dawn Yanagihara.